June 2005, Volume 2 Issue 6 Know It - Profit! This Sector Keeps On Rising!" The broad markets appear to be staging a come back. Is it for real? Or, are we in for another decline? Also, the real estate market has been hot for a long time. Is it still safe to get in and ride this sector higher? 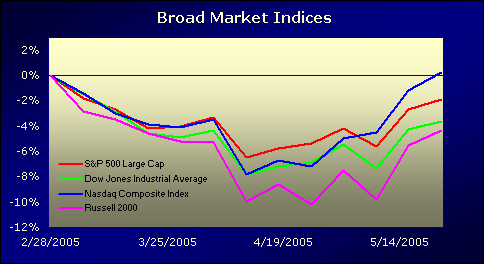 The broad market indices seem to have pulled out of their spring slump. Strong performances in the Internet sector have launched the Nasdaq into the black. The good news... higher highs and higher lows are supporting the market has we head into the quieter summer trading session. Additionally, lower oil prices will help prop-up the market. 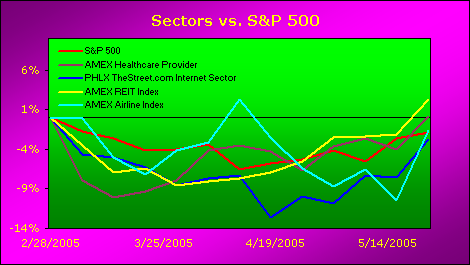 The AMEX Healthcare Provider and AMEX REIT Index are in a strong up-trend. Surprisingly, the turbulent airline industry is taking off! The AMEX Airline Index is up ten percent for the month. 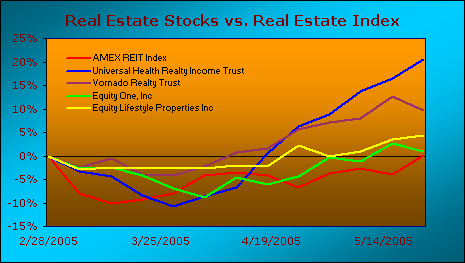 Universal Health Realty Income Trust is making an impressive climb. Vornado Realty Trust is making solid gains, as well. And... Equity One, Inc has recently moved into positive territory. Equity Lifestyle Properties Inc (ELS) has been making steady gains over the last couple of months. 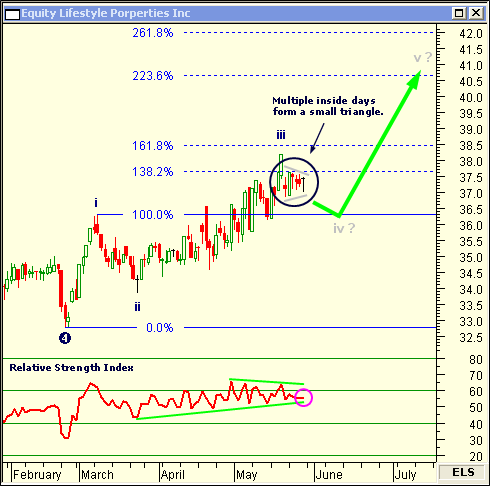 ELS completed a minor Elliott Wave iii in the projected Fibonacci extension zone of 138.2 - 161.8 percent. A 50 percent retracement to $36 marks the wave iv target. Multiple inside days have formed a small triangle. Look for a quick down-side break-out to the wave iv target. The Relative Strength Index remains above 50... predicting more growth is ahead. The wave v target is forecasted using a Fibonacci extension zone of 223.6 - 261.8 percent. Grab a copy of Michael Jardine's New Frontiers in Fibonacci Trading for a more detailed look at this forecasting method. Although only one sector and one stock was featured in this issue, you'll want to take a closer look at the other sectors and stocks that were mentioned. There are many more trading opportunities to be discovered in those sectors... by applying the same easy analysis methods I use each month.